Last November, we presented a new project ambitious show: The B2Vape Exhibition. It is with disappointment that we learn through the voices of the organizers (Anthony, Christophe and David) that the grouping that was to take place in Lille in May is finally canceled due to an insufficient filling rate. 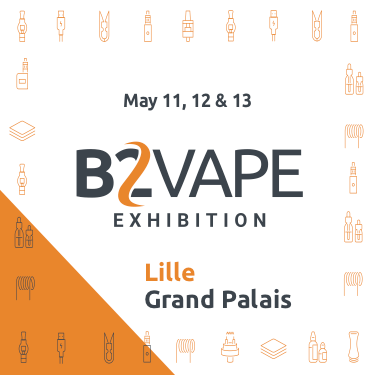 Like most salons that have tried the experience of moving to France, the B2Vape Exhibition will not take place. The B2Vape Exhibition which wanted to be a human-sized salon and a future business facilitator will not have had the time to prove itself as an alternative project of the famous Vapexpo. The fill rate is a priori insufficient (45%) yesterday, the organizers have issued an official statement announcing the cancellation of the show. We regret wholeheartedly the cancellation of this project that could have created diversity in the French vape. Since its beginnings, B2Vape Exhibition wanted to be a fair respectful, fair and attentive to everyone. A show in the image of its organizers. We have made a point of honor to work in this direction since the very first hours of this project. Many of you have welcomed our event with open arms and adhered to our approach. We thank them sincerely. The support that was yours touched us and we wanted to offer you this event, so that all together we make it a success. We could count on the fact that there is almost 4 months before the event and that many players could still join us, but it would also be to take risks of losses to our participants. Faithful to our ethics, we do not wish to make them run this risk. However, unless 4 months of the event, we know that exhibitors will begin to make the necessary arrangements for their travel. Booking hotels, transport, stand layout ... All these expensive posts that could hurt many players in the market if a late cancellation took place. Respectful of the values ​​that are ours and people having trusted us, anxious not to penalize them and given the current low filling rate, it is with sadness that we announce you must cancel the B2Vape Exhibition. We are sad that this new gathering can not see the day, but happy to have tried to give it life and to remain faithful to our line of conduct. Happy to have tried to get things done and to have succeeded on some points. Happy the beautiful encounters created by this adventure. Be certain that this heavy decision is made only for the sole purpose of not jeopardizing our exhibitors. We wish good luck and good luck to our fellow organizers of events and wish success to the next Vapexpo Nantais. We will also salute our few critics who have engaged in such low maneuvers that we will not develop here and now.